Carver Bancorp, Inc., is the holding company for Carver Federal Savings Bank, a federally chartered savings bank offering consumer and business banking products and services. Carver originates mortgage loans to purchase or refinance one- to four-family residential, multi-family residential and commercial properties; originates or participates in loans for construction or renovation of commercial property and residential housing developments; and provides loans to business and non-profit organizations. The presentation was made in honor of the late Richard T. Greene, Sr., who enjoyed an illustrious career as a leading executive at Carver for more than 35 years and founded the Carver Scholarship Fund in 1983. 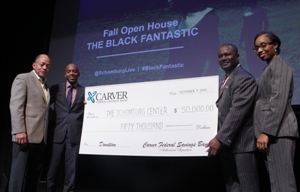 Carver’s gift will be designated for the Schomburg’s Junior Scholars Endowment to support enrichment activities for young students, including a Richard T. Greene, Sr. Leadership Talk. The contribution will also provide essential, ongoing support enabling the 125 Junior Scholars to benefit from exposure to African American role models that will help to motivate and empower them in their academic and professional careers. Copyright © 2019 Carver Federal Savings Bank. All rights reserved.